High hopes does not even approach the anticipation I felt for The Last Airbender. It was a chance for M. Night Shylamalan to reclaim his mantle of storytelling excellence, it was the perfect opportunity to display fantastic visuals, and it was a great chance to introduce the world at large to the acclaimed anime property. It turns out it was just a messy disaster. I really wanted to like the movie, but bad casting, painfully bad writing, and waxy acting made for a film that no amount of beautiful art direction could save. 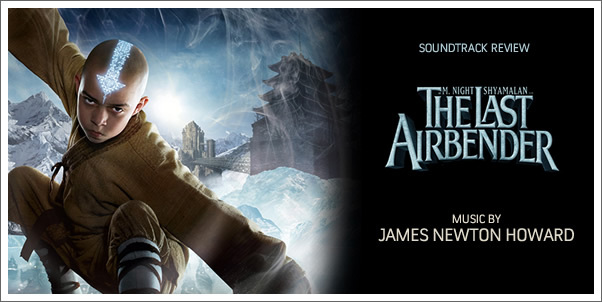 Enter JAMES NEWTON HOWARD, swooping in to the rescue to deliver a score that is so majestic, appropriate, and authentic that it manages to salvage the experience. This is JAMES NEWTON HOWARD in full form, with all pistons pumping and all the familiar favourite traits from past scores making an appearance. It is a tour de force of contemporary film scoring with one foot firmly in the grander styles of yesteryear.